A Sri Lankan Hindu activist is campaigning to create awareness about the ancient Nandi (sacred bull) flag and revive the practice of hoisting it at religious functions and temple festivals. “Muslims raise the Islamic flag, the Buddhist raise theirs, but Hindus do not hoist any though they have the Nandi flag,” says Sinnadurai Dhanapalaa, senior vice president of the Colombo branch of the World Saiva Council. “Over the years, the practice of hoisting the Nandi flag at temples in Sri Lanka and Tamil Nadu has been discontinued. The significance of the Nandi (the sacred bull) and the Nandi flag is not appreciated enough,” Dhanapalaa told IANS. Saivites are worshippers of the Hindu god Siva, one of the supreme trinity, comprising Brahma (the creator), Vishnu (the preserver) and Siva (the destroyer). Saivism or Saiva Siddhanta is followed in many parts of India. Dhanapalaa’s book, “The Significance and Glory of the Nandi Flag,” will be released at the Fourth International Saiva Siddhanta Conference in Madurai in Tamil Nadu March 22. In the ancient Hindu texts, the Nandi is described as Nandikeshwara or a bull-faced human body that resembles Lord Siva. It has four hands, one holding the Parasu or the axe, the second holding the Mruga or the antelope, while the third and the fourth are joined together in Anjali or obeisance. Nandi or bull worship goes back to the Indus Valley civilisation, in which dairy farming was a key component of the economy. The Nandi has since been worshiped as “pasupati”. It has a major role in Hindu mythology. When the “devas” or the celestial positive forces and the “asuras” joined to churn the ocean to get the nectar of immortality, they used Vasuki, the serpent, as the rope. The churning was so painful that the serpent spat out its poison, which was human “karma”. The poison was so strong, that the whole world was under threat. As the devas and asuras recoiled in horror, Lord Siva took the poison in his palm and drank it to save the world. A bit spilled out. On seeing it, the Nandi bull, which was there, drank it up unhesitatingly. The devas and asuras were alarmed by Nandi’s audacity but Siva assured them that Nandi would come to no harm because he was his devotee. A European missionary, Rev. Alastair McGlashan, had warned that the widespread use of the Nandi flag might encourage exclusive and aggressive loyalty and kindle violence. 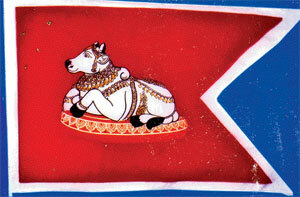 It is known that the Nandi flag was the flag of the Tamil kings of Jaffna in ancient times. When Sri Lanka gained independence in 1948, it was the Nandi flag that was hoisted in Jaffna, while in the rest of Sri Lanka, the lion flag associated with the Sinhalese Kandyan kingdom was hoisted. Dhanapalaa and Varathasuntharam are aware of these and make it a point to assert that the call to raise the Nandi flag has no political agenda. “The Nandi flag is to be a rallying point for the Hindus, an object with which they can identify, an insignia of their faith. There is no intention to promote aggression against any group,” Dhanapalaa said.